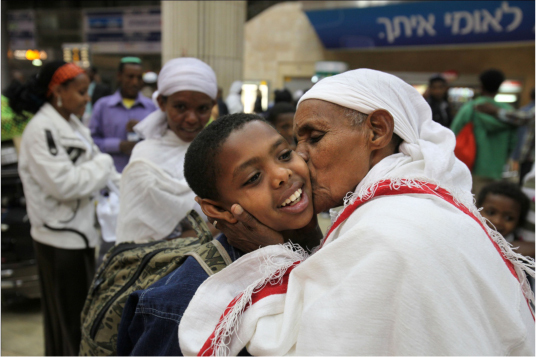 An editorial in the Jewish Week – “Why The Delay In Ethiopian Jewish Aliyah?” calls attention to a strange hiccough in the aliyah of Ethiopia’s remaining Jews. Despite an agreement reached in November 2010 between the Israeli government and a number of advocacy groups on behalf of Ethiopian Jewry to bring this last group out at a rate of 200 a month — so that everyone on a list determined to be Jewish would be out by March 2014 — the government has reduced the monthly number to 110, extending the completion date to March 2015. Here we present a gathering of Makom materials referring to Ethiopian aliyah, and their absorption into the country, including a wonderful collection of photos from Gondar – the place where Ethiopian Jews will apparently remain for two more years.